Edgar Thomas Collins, born 7 March 1873 at Williamsport, Pennsylvania, graduated from the United States Military Academy in 1897. In the Spanish-American war he fought with the 1st Brigade in the battles of El Caney and San Juan Hill and during the siege of Santiago. In the years that followed Collins served at various American and foreign posts, often as an instructor. He went to France in 1917 as an observer on the British and French fronts and returned in 1918 to become Chief of Staff, 85th Division. Later Collins rose to the post of Chief of Staff, 6th Corps, and was awarded the Distinguished Service Medal. Following the war, staff and infantry instructor assignments led to his commanding the Infantry School, Fort Benning, Georgia., in 1926. 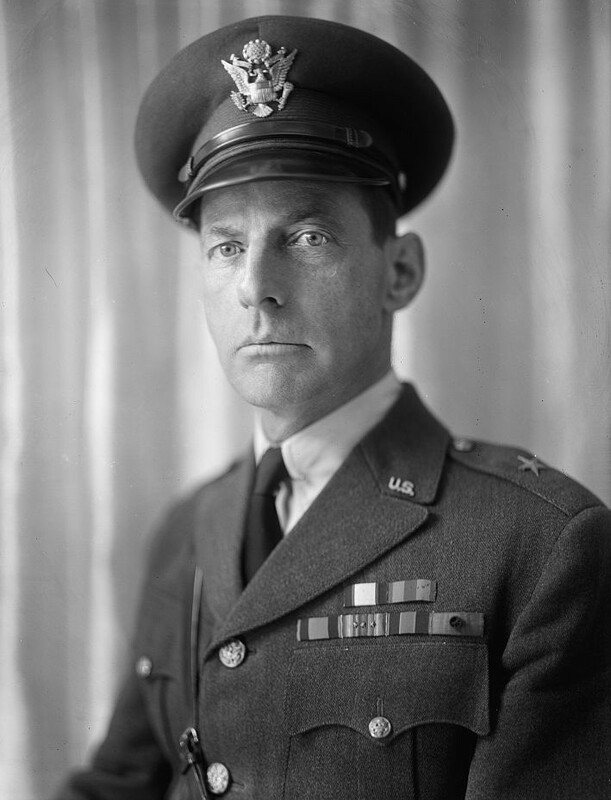 Retired as Assistant Chief of Staff 31 May 1932, Major General Collins died 10 February 1933 at Washington, D.C. He was buried with full military honors in Arlington National Cemetery. 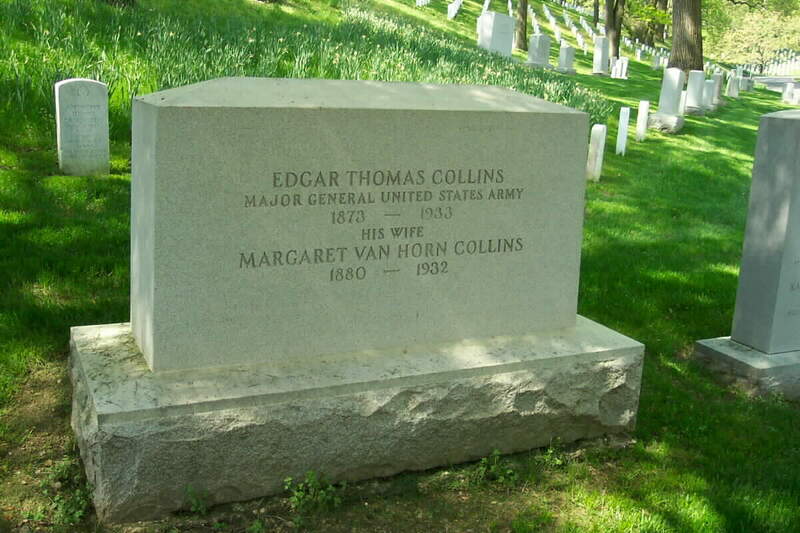 His wife, Margaret Van Horn Collins (1880-1932) is buried with him. WASHINGTON, January 16, 1932 – Mrs. Margaret Elizabeth Van Horn Collins, wife of Brigadier General Edgar T. Collins, commander of the Sixteenth Brigade here, died in Walter Reed General Hospital today after a long illness. Mrs. Collins was the daughter of the late Colonel James J. Van Horn, USA. Besides her husband, she is survived by two daughters, Miss Margaret Katherine Collins of this city, and Mrs. Barnett, wife of Captain Allison J. Barnett, now at Fort Leavenworth, Kansas; a sister, Mrs. Bishop, wife of Major General Harry G. Bishop of this city, and two brothers, Colonel Robert O. Van Horn, now on duty at the University of California and Lieutenant Colonel James H. Van Horn, now in this city. WASHINGTON, February 10, 1933 – Major General Edgar T. Collins, Assistant Chief of Staff of the Army for Operations and Training, died today at Walter Reed Hospital at the age of 59 after a long illness. He was an officer with distinguished records in the Spanish-American War, the Filipino Insurrection and the World War. Funeral services will be held at Fort Myer Chapel, Virginia, at 11:15 A.M. tomorrow, with Colonel Julian E. Yates, Chief of Army Chaplains officiating. Burial will be in Arlington National Cemetery with full military honors. The honorary pallbearers will be General Douglas MacArthur, Chief of Staff; Major Generals George Van Horn Moseley, Deputy Chief of Staff; Robert E. Callan and John W. Gulick; Brigadier General Andrew Moses and Colonels Duncan K. Major, Edgar A. Myer and Resolve P. Palmer. A veteran of the Spanish-American War, the Filipino Insurrection and the World War, General Collins held many important posts in the United States Army during his distinguished military career. Appointed a Brigadier General November 3, 1924, he was made Assistant Chief of Staff, G-3, in charge of the Operations and Training Division of the War Department, General Staff, on February 2, 1932. Seven months later he was promoted to the rank of Major General. During the World War General Collins, then a Colonel, was Chief of Staff of the Seventy-Eighth (Lightning) Division at Camp Dix, New Jersey, later holding the same position with the Sixth Army Corps in France. In recognition of his war services he received the Distinguished Service Medal and was made an officer of the Legion of Honor of France. General Collins was born in Williamsport, Pennsylvania, March 7, 1873, a son of Jeremiah and Katharine Hyde Collins. He was commissioned a Second Lieutenant of Infantry on his graduation from the United States Military Academy in 1897 and assigned to the Eighth United States Infantry at Fort D. A. Russell, Wyoming, serving with that regiment until the outbreak of the Spanish-American War. As a staff officer with the First Brigade, General Collins participated in the engagements of El Caney, San Juan Hill and in the siege of Santiago during the Spanish-American War. He remained on duty in Cuba, except for a short period as a recruiting officer in Philadelphia, from the end of hostilities until 1900, when his regiment was ordered to Fort Snelling, Minnesota. Soon afterward the Eighth Infantry was ordered to the Philippines, when an insurrection had broken out. After serving throughout the insurrection, General Collins was made a First Lieutenant, receiving his Captaincy in 1902 and being transferred to the Sixth United States Infantry at Fort Leavenworth, Kansas. With this regiment he saw service again in the Philippines and later was ordered to Fort William Henry Harrison, Montana. A detail as a student officer at the Army School of the Line, Fort Leavenworth, then followed in 1909, from which he graduated with honors the next year. He also was graduated from the Army Staff College in 1911 and was assigned Inspector General of the Wisconsin National Guard. Rejoining the Sixth Infantry, he was ordered to the Presidio at San Francisco and in 1913 was transferred to the Tenth Infantry in Panama. General Collins was an instructor at the Business Men’s Training Camps at Plattsburg in the Summers of 1915 and 1916. H became senior instructor there immediately after the United States entered the World War and after he had been graduated from the Army War College in Washington. Following a tour of duty as Chief of Staff of the Seventy-Eighth Division, comprising National Guard troops from New York, New Jersey and Delaware, he was ordered to France as a military observer on the French and British fronts. He returned to the United States several months later and was made Chief of Staff of the Eighty-Fifth Division at Camp Custer, Michigan, sailing for France again with that unit in July 1918. General Collins was detailed to the General Staff at General Headquarters of the A.E.F. until his appointment as Chief of Staff of the Sixth Army Corps in October 1918. In the latter position he played a prominent part in the operations in the operations in the St. Mihiel and Meuse-Argonne offensives, later serving in several defensive sectors. General Collins returned to the United States in 1919 and was ordered to the General Staff College in Washington as a student and then as an instructor. Completing this duty he was made Chief of Staff of the First Division at Camp Dix. In 1921 he was ordered to Washington for duty with the War Plans Division and later the Operations and Training Division of the War Department General Staff. After he was made a Brigadier General in 1924 he studied at the Infantry School, Fort Benning, Georgia, and at the Field Artillery School, Fort Sill, Oklahoma. He served as commanding General of the First Field Artillery Brigade at Fort Hoyle, Maryland, until March 1926, when he was appointed head of the Infantry School. The Sixteenth Infantry Brigade at Washington was his next assignment, to which he was assigned November 25, 1930, holding this position until he was detailed to the War Department as Assistant Chief of Staff, G-3. General Collins married Miss Margaret Van Horn, daughter of the late Colonel James J. Van Horn, United States Army, October 5, 1898. She died January 17, 1932. They had two children, Mrs. Frederick Viehe Armistead and Mrs. Allison J. Barnett, who survive. General Collins was an Episcopalian. He belonged to the Army and Navy and the Chevy Chase Clubs in Washington. WASHINGTON, February 11, 1933 – The simple funeral service – a short prayer, three rifle volleys and “Taps” – was performed today for Major General Edgar T. Collins, native of Pennsylvania, who died yesterday after a lifetime in the Army. On Arlington National Cemetery’s snow-covered hills, crack parade troops carried through the Army ritual in the presence of ranking officers of the service. Honorary pallbearers included the Chief of Staff of the Army, General Douglas MacArthur; Major Generals George van Horn Moseley, Robert E. Callen and John W. Gulick; Brigadier General Andrew Moses, Colonels Duncan K. Major, Edgar A. Myer and Resolve P. Palmer, all of whom had served with the officer.